Do you want to find out how to make your content accessible for everyone? In our latest 3Ps we covered a range of accessibility tools and tips to ensure that we can quickly and easily make new and existing materials accessible to everyone. How to use styles, colours, alt text to create accessible content. Some of the frustrations staff and students might experience and how to overcome them. If you weren’t able to attend the session you can have a go and test your accessibility knowledge with the Accessibility Checking Activities. The Microsoft Office Accessibility Center is a great place to look for handy guides on producing accessible Office documents with out of the box accessible templates. Microsoft Office is available for free to all staff and students and has some great Microsoft Accessibility Features built in. Staff and Students have access to Adobe Acrobat Pro from University Machines. Acrobat has a built in PDF Accessibility Checker which can automatically fix issues with your PDFs and also advise you on why certain elements aren’t accessible. The session focused mainly of text and images but if you’d like to find out more about creating accessible audio and video content you check out our blog post on creating captions. For disabled users accessing IT services on campus we offer specialist software and hardware available to staff and students via our Easy Access Accessibility Service. Download and print copies of our A4 checklists for Word, Powerpoint, PDFs and Blackboard and keep them with you for quick reference. The Student Health and Wellbeing Service provides information, advice and guidance on a wide range of student support issues, helping students to maximise their potential whilst at university. Congratulations to the Newcastle University Medicine Malaysia (NUMed) Anatomy Working Group (AWG) who were awarded the Gold Award for their recent participation in the Innovation in Anatomy Teaching Competition at the Malaysian Anatomical Association Education Symposium (MAAES) in Kuala Terengganu. Following the introduction of the Teaching Excellence Framework in 2017, UK Universities are required to demonstrate a culture of continuous improvement in the quality of learning, teaching and student experience that students receive. The University aims to achieve this by delivering an educational experience within a research informed, supportive and engaging academic environment that adds value to learning. Such added value will ultimately provide students with opportunities to develop both personal and professional skills and attributes, enhance their career prospects, and prepare them for active participation in society as responsible and ethical global citizens. 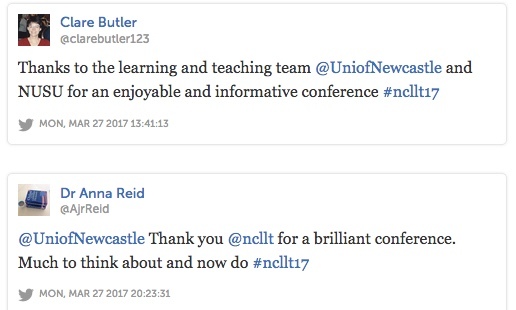 In 2017 the Newcastle University annual Learning and Teaching Conference took place on 27 March 2017. Newcastle’s commitment to excellent teaching is at the heart of our University mission, and is crucial to our aim of providing an educational experience that challenges and supports our students to fulfil their potential. At a time when external agencies are seeking to define this for us, it is more important than ever that we have a clear understanding of what we as an academic community understand by learninhe phrase ‘teaching excellence’. contribute to how the University will pursue excellence in learning and teaching in the future through a session on the development of our new University Learning, Teaching and Student Experience Strategy. Facilitated by Craig Smith from Flint Spark Consulting. View the list of poster presentations at the 2017 Learning and Teaching Conference, and view the posters online. How can you engage large student cohorts in the classroom/lecture theatre? And how could you maintain those connections when the lecture is over? How do you make meaningful connections with all your students? Aimed at academic and professional services staff these practical workshops draw on examples of effective practice from within the University and from outside. Ranging from using technology effectively, and utilising basic acting techniques, to creating accessible materials for everyone, we share ideas and tips you can take away and try with your large groups tomorrow. In this workshop we share tips and tricks for how we can effectively manage large groups in the lecture theatre, You’ll be able to try out some techniques for yourself in this interactive session, with case studies from colleagues from across the University and some practical exercises ranging from maintaining audience attention and using lecture theatre technology to how to stop your voice giving out as term progresses. The recent NUSU report on the Teaching Excellence Awards contained some gems of information from students, one of which was that they really value the activities before and after a lecture. But how do you build meaningful activities and maintain attention outside of the lecture theatre? This workshop looks at ‘the lecture sandwich’ where we share tips and get some hands on experience of using Blackboard, ReCap discussion boards etc to help build collaborative learning before and after the lecture. We also look at boundary setting and expectation management with email and in discussion boards. Drawing on inclusive learning principles this cluster based hands on workshop focuses on learning for all and reaching everyone on your large group. We share tips on using multiple communication channels, and how using module handbooks, reading lists, well structured documents effectively can help get to hard to reach students. You can choose to come to all three or just pick the ones that best suit your needs. And bring a sandwich with you, if you like. 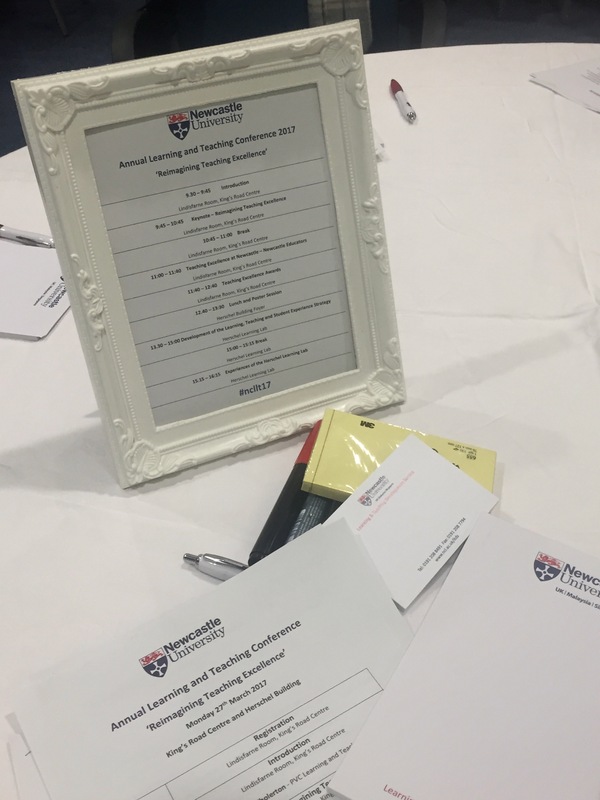 The annual Learning & Teaching Conference for staff at Newcastle University took place on Monday 27 March 2017. Celebrating learning and teaching at Newcastle University, it was organised by ourselves on behalf of the Pro Vice Chancellor for Learning and Teaching, Professor Suzanne Cholerton. 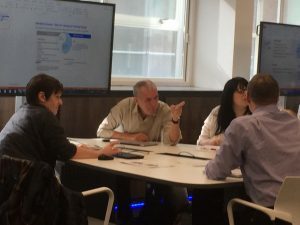 This year’s theme was Reimagining Teaching Excellence, and the day was spread over two venues: the Lindisfarne Room in the Kings Road Centre and the Herschel Learning Lab, with lunch and an engaging poster session in the foyer of the Herschel Building. We started with a short introduction from Suzanne Cholerton who thanked everyone for their contributions to making the student learning experience and Newcastle’s teaching reputation so good, before introducing our keynote speaker, Professor Paul Blackmore from the Policy Institute, Kings College London. Paul spoke eloquently about making curricular changes in higher education institutions and introduced us to examples from all over the world, including Melbourne Arizona State and Hong Kong Universities, whilst provoking questions about how such decisions are made, the associated risks, and how we know whether these interventions have been effective. He went on to question Biggs’ ideas on constructive alignment, much quoted in educational development, and suggested these ideas were a good servant but a bad master for developing curricula. Asking what the real links are between research and teaching, he moved on to discuss the recent White Paper and the Teaching Excellence Framework (TEF). He also covered themes around commodity, interdisciplinarity, globalisation and networks. Professor Blackmore’s keynote was well received and set the scene well for challenging what teaching excellence is, and for taking risks when thinking about changing the curriculum. Next, Sara Marsham, JC Penet and Vanessa Armstrong took the stage to talk about teaching excellence and the Newcastle Educators peer educator network. In an interactive session they asked us to share ideas of what teaching excellence is or could be, and made the point that the concept is very culturally bound. The last session of the morning had everyone scribbling notes furiously as representatives past and present from the Newcastle University Student Union (NUSU) talked about the analysis they had done on the NUSU Teaching Excellence Awards, highlighting some of the report‘s findings. Students at Newcastle value an eclectic mix of learning and teaching approaches including blended learning, flipped classroom, TEL, and collaborative approaches to learning. Our students see learning as incremental, and appreciate the intellectual generosity of their lecturers, their knowledge and expertise. They like lectures to be a conversation, through use of open discussion and participation in the learning process. This creates an atmosphere where students feel enabled to contribute and speak up, as well as opportunities to talk to staff informally. The report highlights that what happens before, during and after the lecture are all important. This really highlighted how much students are engaged in thinking about good teaching. They really don’t see academic time as an unlimited, on-demand service. At lunch the poster session took place and the audience was asked to vote for their favourite posters. 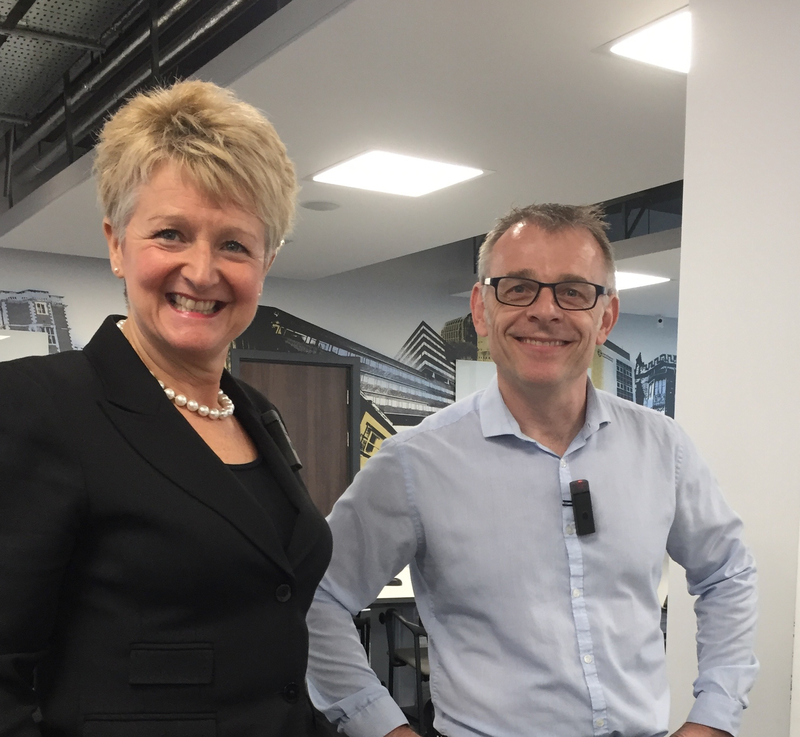 Professor Suzanne Cholerton (L) and Craig Smith (R) of Flint Spark Consulting led the first afternoon session. For the afternoon sessions we moved from the Lindisfarne Room to the Herschel Learning Lab. 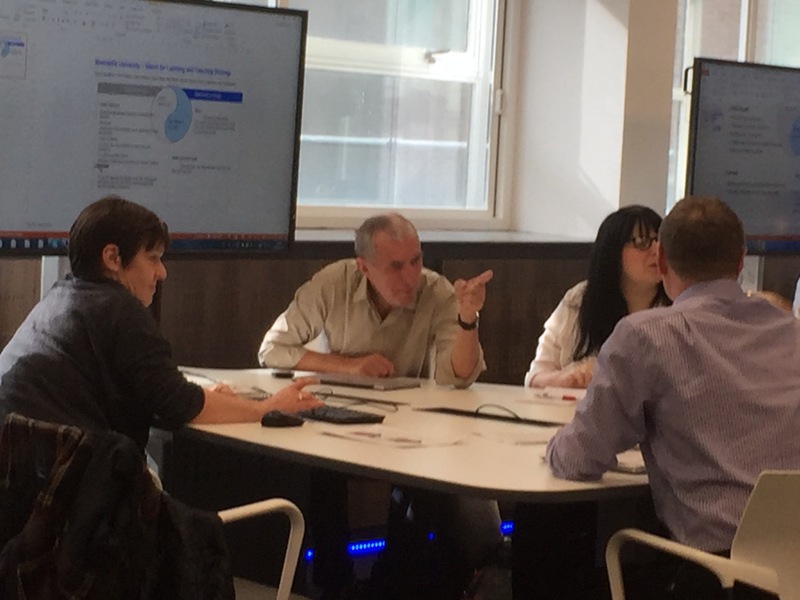 A session using the facilities in the Herschel Learning Lab was facilitated by Craig Smith, who looked at developing the Newcastle University Learning, Teaching and Student Experience Strategy. Attendees contributed their ideas about the key factors that the new strategy should include, collaborating in group and utilising the room’s technology. We attempted to use all of the affordances of the Herschel Learning Lab (HLL) in this highly engaging session (not least because of the omnipresence of Tina Turner!). 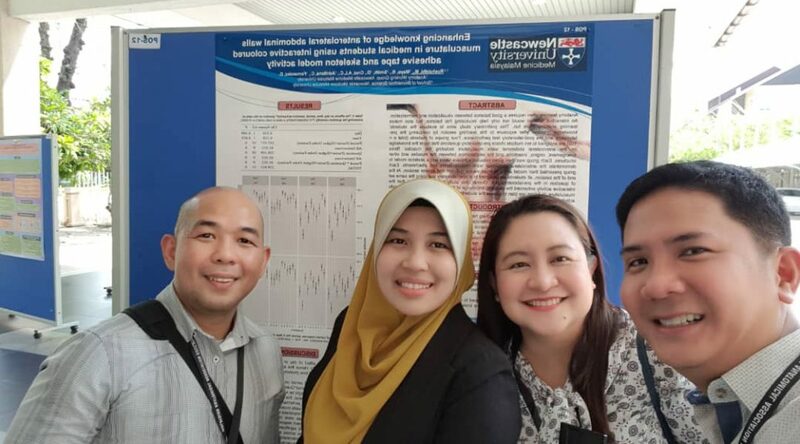 Some colleagues who have successfully used the HLL then showed us how to use it properly. Ulrike Thomas, Ellen Tullo, TT Arvind, James Stanfield, and Katie Wray were all familiar with the space and outlined how they had successfully used it with some diverse cohorts over very different courses, from all three Faculties. Ulrike reminded us that we can look at learning spaces in the teaching room finder. TT suggested that planning how you were going to use the technologies in the HLL was essential to success, and by using the affordances of the space, the barriers between teaching and learning could be broken. Linear and block teaching, group meetings, workshops, society meetings all worked well in the space said Katie Wray, but group work, collaboration using activities, engagement and video all worked particularly well. What worked less well? More than 20 groups, lectern based lectures, and the inflexibility of the space all posed challenges. The resources from the day are available from the LTDS website. Don’t forget you can find many examples of effective learning and teaching practice on the case studies database. Please comment on this post, or email ltds@ncl.ac.uk to let us know how we can make next year even better! Dr Jane Stewart will be hosting a lunchtime workshop on Tuesday 10 January 2017 on the subject of ‘Developing Lesson Plans’. This workshop will cover the principles of lesson planning and discuss some basic strategies for developing your approach. The workshop will be useful to those who have had no formal training in teaching or wish to refresh their knowledge around lesson planning. For the workshop it is helpful to have a particular lesson in mind. To facilitate this, please bring along your PowerPoint presentation or any resource that helps guide your delivery. The workshop will be held in room RIDB2.1.53, 13.00 – 14.00. Due to room capacity it is important that you register your attendance with Sharon.griffin@ncl.ac.uk. There are a range of other learning and teaching lunchtime sessions throughout the term. See schedule. The next annual North East Regional Three Rivers Learning and Teaching Conference will be held on the 17 March 2017 at Teesside University. Now in its 10th year, this regional conference builds upon the success of previous partnership events held by the region’s Universities (Northumbria, Sunderland, Durham, Newcastle and Teesside). The conference title is ‘Transformations, Transitions & Territories’ and further information can be found on our website. Submissions are welcome from all staff at participating institutions and joint student/staff submissions are encouraged. Please read the supporting information before writing your abstract. Please submit abstracts by 16th December 2016. Proposers will be informed of the outcome of the selection process in January 2017. For further information, please contact Rosa Spencer in Newcastle’s SDU or Richard Sober at Teesside. Vice-Chancellor’s Award – Winners Announced! We are pleased to announce that this year’s Vice Chancellor’s Distinguished Teachers Award winners are Jean-Christophe Penet (SML) and Clare Guilding (SME). Both Clare and JC will receive their awards in congregations taking place today. 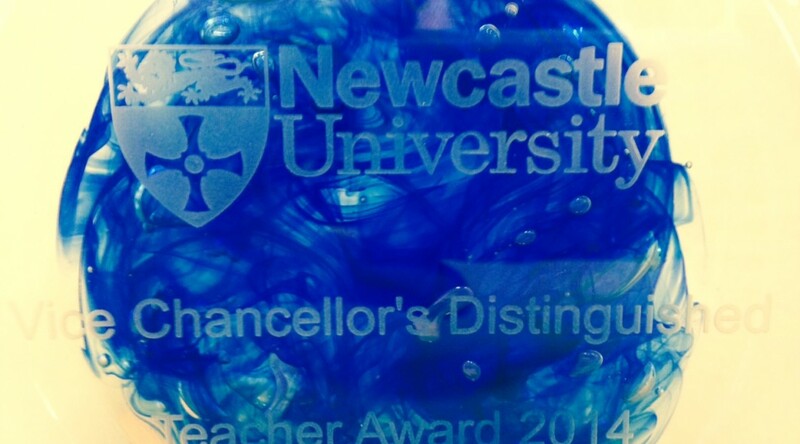 The awards were launched in 2010 in order to celebrate and recognise outstanding teaching at Newcastle. Each year three types of award are made; two for academic staff – a general award and an award for staff working within the societal challenge theme; and one for professional support staff. Candidates for the awards are expected to demonstrate leadership in teaching and learning and to innovate across the areas of pastoral care, supervision and curriculum design. Clare’s innovative teaching techniques have already been the subject of one of our Case Studies, which looked at her use of Sim-Man to teaching students diagnostic techniques! She has also been nominated for numerous Newcastle University Student Union Teaching Excellence Awards for Innovative Teaching Methods, Contribution to Pastoral Support and last year picked up the Overall Outstanding Teacher Award. She has also received the Association for the Study of Medical Education (ASME) EDG Educator Innovator Award (January 2016) and British Pharmacological Society Education Prize (December 2015). Jean-Christophe is a lecturer in French and Translation studies in the School of Modern Languages. A founding member of the peer-support network EDUBITES and a committed advocate of peer support for teaching –focused staff, he’s the Employability Officer in his School and runs a range of initiatives with local businesses. 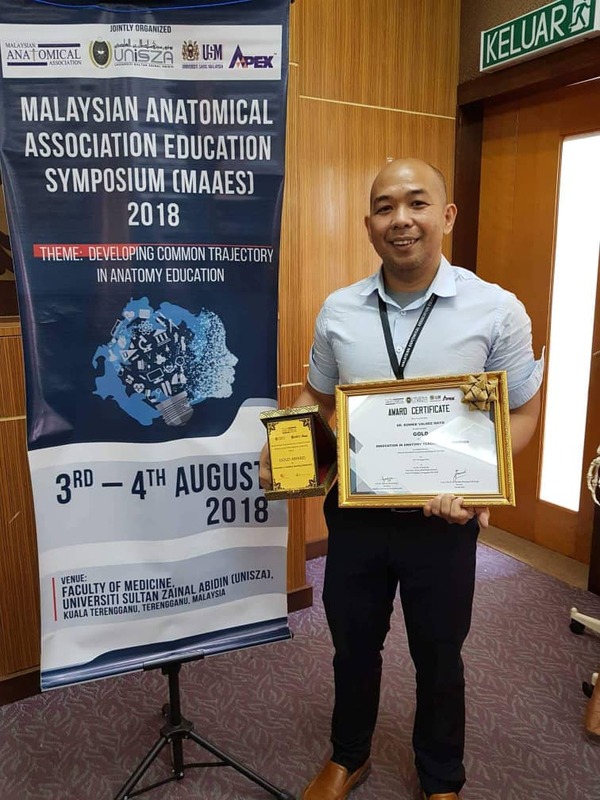 He said: ‘I like especially that these awards are not based simply on module evaluations or peer review but on a more holistic approach to teaching and learning, taking in lots of elements of professional practice. Unfortunately there were no nominations in the Professional Support Staff category this year – we hope that this will be rectified next year and would like to encourage staff to nominate support staff who have made an outstanding contribution to learning and teaching. You can read profiles of each of the VC Award winners and hear more about what they think makes for outstanding teaching on the LTDS blog next week! Our 12th annual Learning and Teaching Conference is only a month away and bookings are now open. You are welcome to attend for the whole day or the morning or afternoon. The theme this year is Assessment and Feedback and we’re looking forward to a lively day of discussion and examples of interesting and effective practice. In particular we’ll be welcoming a panel of teachers to help us understand more about the assessment students undertake before they come to university. 15.00 Teacher Panel: How Does Feedback and Assessment at School Impact University Transitions?